Moravian National Community (MNC) is a nonpolitical civic association that unites people who are not indifferent to the history, present and future of Moravia and Moravians. It associates friends of the history, culture and traditions of Moravia. Its objective is to strengthen Moravian national consciousness through knowledge, research and promotion of historical values and monuments, and by organising various public events. 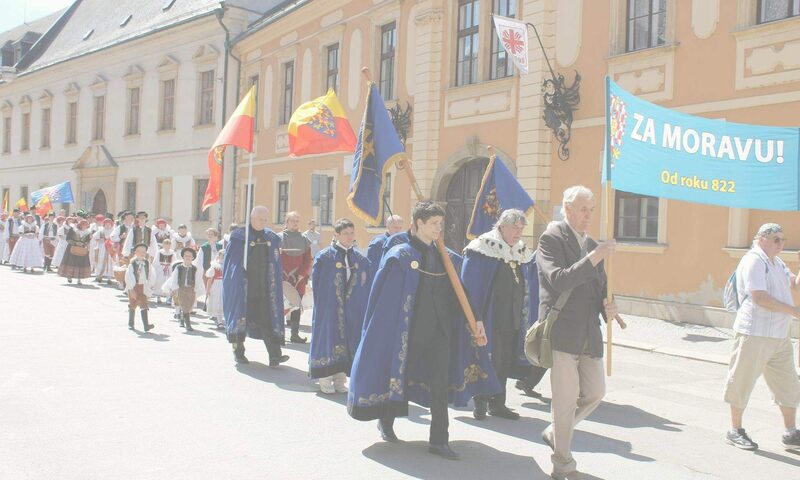 The Moravian National Community also endeavours to enhance social progress and cultural distinctiveness of Moravian society, and it strives to achieve Moravia’s return into the position that it deserves within the Central European context. As the number of Moravian patriots living abroad is steadily growing, we have decided to establish local chapters for all who would like to contribute to making Moravia more visible internationally. The MNC Abroad Local Chapter unites Moravian patriots living, working or studying abroad, away from their homeland, who do not want to lose ties with their native land, its history, its culture and its heritage. It also associates foreigners who have positive feelings towards Moravia and Moravians, or who are descendants of Moravian exiles and emigrants and are concerned about the native land of their ancestors. In short, MNC Abroad exists for the interest of anyone located abroad who cares about the present and future of Moravia, as well as those who support the emancipation efforts of Moravia and Moravians. Since MNC Abroad members and friends are scattered all over the world, their participation at meetings of the MNC and other events within Moravia is rather difficult; therefore in order to help and support Moravia we try to actively contribute via internet social networks and through approaching other fellow countrymen living abroad. We all believe that together we can help Moravia earn respectability and honour which it held until recent times, not just within the Czech Republic but across Europe and the entire world as well. If you are curious about our MNC Abroad Local Chapter or have questions or suggestions, please do not hesitate to get in touch with our chair, who will gladly answer your questions and consider your suggestions. Chairwoman: Zuzana Körnerová, Jersey UK, e-mail: kornerova@zamoravu.eu. Presentation about Moravian National Community from international conference Self-determination of European regions and peoples, held in Brno, September 2016.